Paths for bicyclists and walkers along 101 and La Conchita named for Ralph Fertig and Peter Douglas. Ralph Fertig holds a certain legendary status within both bicycle and government circles, and that’s because he was “quiet, unassuming, and absolutely dogged” as Assemblymember Das Williams’s resolution reads to name the bikeway along the 101 between Rincon and Mussel Shoals in honor of Fertig, who died in 2014. The resolution, ACR 58, passed with nary a “no” vote in the California Legislature, and included naming the pedestrian undercrossing at La Conchita after Peter Douglas, the equally storied executive director of the California Coastal Commission for 25 years. 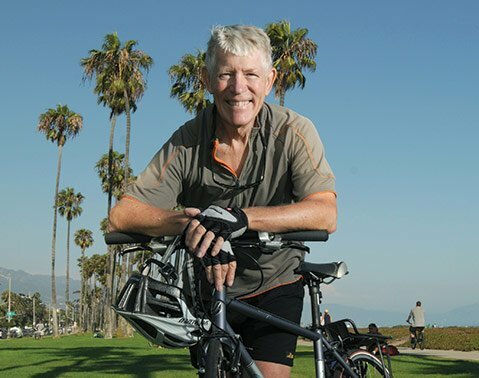 Fertig fought the good fight for better bicycle infrastructure in Santa Barbara, earning the respect of all he encountered in his tireless quest for cycling improvements and smart transportation planning. The four-mile, Class I Ralph Fertig Memorial Bicycle-Pedestrian Path joins 1,852 miles of the Pacific Coast Bike Route that runs from Vancouver to the Mexican border. Douglas retired from the Coastal Commission in 2011 after a cancer diagnosis, and he died in 2012. He is remembered as a fierce partisan for coastal protection and the creation or preservation of numerous coastal parks, beaches, campgrounds, trails, and hostels. When Caltrans’ 101 bike- and walk-ways were proposed in 2008, Douglas’s suggested improvements resulted in a redesign to the paths ridden and walked upon today. The underpass at La Conchita is now dubbed the Peter Douglas Coastal Access Way.